I previously ventured into the deep waters of independent reading management programs a number of years ago with my article, The 18 Reasons Not to Use Accelerated Reader. 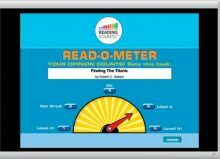 Accelerated Reader™ is the most popular independent reading management program with 180,000 book titles (January 2019) assigned a Reading Practice Quiz. RC is the second place challenger with 45,000. Teacher comments on my article tend to focus more on the abuses of the program, and less so on the program itself. Many teachers are quite defensive about their use of the AR program. Understandably so. We teachers view our instructional choices as reflections of our professionalism. Curriculum is personal. In anticipation of similar comments to this article on Reading Counts!, I would like to preemptively respond by saying, “I’m sure that you are doing your part to adapt the Reading Counts! program to the needs of your kids, and I respect your professional judgment that you know your students best.” Please don’t shoot the messenger! 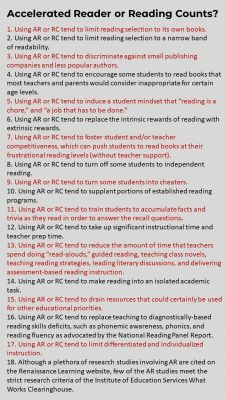 However, as I re-read “The 18 Reasons Not to Use Accelerated Reader” in preparation for this article, I would have to say that most of the problems in the AR program are applicable to the RC program, as well. I won’t cover the same ground in this article. However, I will analyze three of the claims made in the RC program, which I see as being more exclusive to this program. But first, a brief overview of how the RC program works. The school and/or district re-allocate portions of their budgets to purchase books included within the RC program. Currently, RC has about 45,000 titles, but unlike the books in the AR program, the company makes money from each sale, because HMH publishes them! These purchases will necessarily become an every-year budget item. The HMS sales representative in-services school librarians, teachers, and administrators (lots of online help, as well) on how to implement the RC program. Suggestions as to how to inform and work with parents and corresponding resources are provided. The program resources are relatively easy to use, but time-consuming. The classroom teacher or librarian administers the computer-adaptive Reading Inventory (RI) as a reading placement test to all students participating in the RC program. This test provides a Personal Lexile® score for each student. Teachers use the Student Achievement Manager (SAM) data and management system to generate student and class reports. The reports list the results of the RI as a Personal Lexile® number (level or measure) for each student and a class Lexile average. A higher Lexile number indicates a higher reading level ability. The reports also list the students’ optimal Lexile text readability levels (a numerical range). A text’s Lexile level is determined by its semantic and syntactic degree of difficulty and sentence length. Once students know their reading levels, they can select books from the Search Book Expert Online ,within these reading levels. Although the RC is a Lexile-based program, it also includes grade-level equivalency and guided reading levels in this search engine. Additional filters include grade-level interest (K–2, 3–5, 6–8, high school, and high interest/intervention), fiction and non-fiction, subject areas, genre, and curriculum-integrated books. Note that the HMS reading intervention programs, READ 180 Next Generation® and System 44® include some RC titles for their independent reading rotations. Teachers and students set reading goals in terms of a point system. Each book is assigned a specific point value based upon its length and text complexity. Many teachers establish a monthly points requirement. Once students have finished their books, they take a corresponding quiz on the computer, or the teacher may choose to print the quiz. Although the test bank for each quiz includes 30 items, the default number of questions is 10. The RC authors and sales representatives make much ado about the larger quiz bank of questions compared to that of the AR program. They claim that is less easy for students to cheat due to the randomized 10 question default when students are sitting side-by-side. This may be true; however, a quick search indicated plenty of RC quiz “cheat sites,” as are found with the AR program. Where there’s a will, there’s a way. Students are allowed to examine their incorrect responses, but there is no pay-off for doing so if the quiz re-takes use different questions. If the students achieve a predetermined score (mastery criteria set by the teacher), they receive a “congratulations screen” and an opportunity to rate the book they read on the “Read-o-Meter.” Students can also check their own RC Student Progress Report. Points are awarded based upon the percentage of quiz questions answered correctly. If the students do not achieve mastery, the teacher may require them to read the book again and retest or re-visit the students’ RI Lexile level range and the level and content of the book. Students are able to take the 10-question quiz 3 times, because there are 30 questions. Teachers generate reports on students’ quiz scores and track the amount of reading and student test scores. They can also receive alerts when a student has not taken a quiz within a given period. Once individual student point goals (usually set monthly) have been mastered, the student receives a certificate of achievement. The Reading Counts! Educator’s Guide provides plenty of reproducibles to supplement the quizzes, such as reading logs, story charts, book reports, parent letters (in several languages), and guides for teachers to write their own quizzes (if the school library does not have the RC book). Claim 1: Students improve their reading more when the complexity of the text they read matches their reading ability. The best test to measure that optimal match or zone of proximal development (Vygotsky, 1978)? The HMH Reading Inventory. Why? The RI is a criterion (compared to a fixed goal, such as a Common Core Standard) and norm-referenced (compared to other students) test. This is important because the test design allows teachers to administer the RI twice more within the school year to monitor progress. The Lexiles, which RI uses, have improved readability assessments (standard errors of measurement have been minimized and the amount of comprehension variance that can be explained by text difficulty has been improved. Accelerated Reader’s STAR test doesn’t have those advantages. Matching the right books to readers is simply more complex than the quantitative Lexile approach RC uses. Content, theme, and sophistication of thought matter, as well as the age and maturity of the reader are critically important factors to consider when students select books for independent reading. Most would find the following strictly quantitative Lexile measurements, listed in parentheses, to be inappropriate criteria for these grade levels. Furthermore, reading research has repeatedly demonstrated the important variable of prior knowledge with respect to reading comprehension. When readers have significant prior knowledge on a topic, familiarity with the genre, or experience with the author’s writing style, even high Lexile level texts can be accessible. Prior knowledge and scaffolding relevant content and context can often trump the quantitative challenges of complex semantic and syntactic text for students. Motivation is another significant variable in matching readers to text that can override the limitations of the RC Lexile levels. My youngest son was in 4th grade when the last Harry Potter novel, Harry Potter and the Deathly Hallows, came out. Clearly, the quantitative Lexile level of 880 should have prevented his MA reading specialist father (me) from purchasing this “frustration level” book. Instead, I dutifully ignored the quantitative data and waited in line with my fourth grader for the midnight release of this treasured book. My son plowed through the book with a high level of comprehension. By the end of fourth grade, my son was reading significantly above grade level. Thanks to motivational influence of J.K. Rowling and the dozens of peers who were concurrently reading and discussion that book during recess. I’m a 6th grader and when I took a Lexile test for my grade, I got stuck with books I hate so much. We had to search for books in my Lexile. I am so bored of those books. I want to read whatever I want to. As a librarian, I have fought for years against leveling books. I was supported my district years ago against AR, but my job as a librarian was shifted to support classroom curriculum instead of supporting reading enjoyment, reference process, and library skills. Now a new deputy superintendent, whose old District used a Lexile based reading program, is spending money on a program that is Lexile leveled. While library books are hardly given any budget money, tens of thousands are being spent… The skills that teachers built by learning how to “fit” a book to a student and teaching students to self-select challenging and interesting reading material is being prostituted to paying publishers for poorly written formulaic books dressed up with attractive level numbers. It is a disservice to our students that ultimately destroys their confidence in becoming independent readers. Claim 2: RC provides the accountability to ensure that students are reading independently. At the heart of this powerful program is the practice provided by its quizzes. 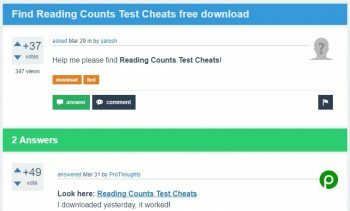 Unlike other reading assessment programs, no two quizzes in Reading Counts! are the same, struggling readers have the opportunity to retake quizzes, and quiz settings can be customized based on individual students’ needs for extra support or challenge. This quiz quality leads to more accurate and actionable data to keep students on track for success. Counterclaim: While the reading research is clear that students who read independently are significantly more likely to outperform peers who do not read on their own (Anderson, Wilson & Fielding 1998), and those who read more independently score higher on reading tests compared to those who read less (Juel, 1988; Juel, Griffith, & Gough, 1986; Stanovich, 1986), the research does not support the claim of the RC authors and editorial board that the type of accountability that the program uses (quizzes) is necessary to achieve optimal reading gains. Each of the 45,000 RC quizzes includes a test bank of 30 questions. They are primarily recall questions with some vocabulary and a minimum number of inferential questions. Few of the questions are relevant to the big ideas or themes of the corresponding books. In essence, the quizzes are designed to hold students accountable for reading their books. Some researchers such as Dr. Stephen Krashen, argue that free voluntary reading, without accountability, produces greater reading gains than independent reading programs with accountability, as with the quizzes in the RC program. You may wish to check out my dialogue with Dr. Krashen on in-class independent reading and accountability. I disagree with Dr. Krashen and support independent reading with accountability. My take is that we teachers have much better methods to hold students accountable for independent reading that also reinforce effective reading practice. For example, as a middle school teacher, I use online peer book clubs and student-parent discussions for my middle school students. I’ve also taught high school ELA and supervised elementary teachers doing the same. Plenty of accountability and practice, using the motivating social nature of reading. And no in-class independent reading. It’s all homework. I’m no guru, but I’m persistent, and I get between 80–90% participation (more the first semester than the last). I teach students and their parents how to self-select reading, informed, but not limited by word recognition measures. However, challenging books need not be the only books students read. Reading at multiple levels has clear advantages and reflects real-world reading. I also train students how to discuss their reading in their online book clubs with their peers (one daily post and two comments required using the SCRIP Comprehension Bookmarks… download follows… to prompt), and I pop in to add my 2 cents. At Back-to-School Night (I require at least one family member to attend, and arrange infinite make-up sessions until I meet with every parent or guardian), I train adults how to hold 3-minute student-led reading discussions and parents assign points for their kid’s 5-days-per-week independent reading and discussion. I’m in a lower, poverty-challenged school with 75% free and reduced lunch, multi-ethnic, multi-languages, etc. If you have tricks up your sleeves to hold students accountable for reading that don’t require additional teacher correction or huge amounts of time, please add to the comments section of this post. At the end of this article, I link to a nicely organized list of articles and free resources for ELA and reading intervention teachers with quite a few more ideas on independent reading. In the RC program, the SAM management system tracks individual and class quiz scores and also the number of words students have read in each book. If a student doesn’t pass the quiz after three attempts, she or he loses credit for having read the book. This means that the number of words the student has read is not tallied, and the student doesn’t receive a reward certificate as quickly. If it’s the independent reading that reinforces comprehension, vocabulary acquisition, and fluency, why doesn’t the student receive credit for doing so? The bottom line is that students receive positive reinforcement for mastering quizzes, not for reading. Reading is not rewarded; passing the quizzes is. Claim 3: RC EMPOWERS educators with reports and actionable data at the student, school and district level. As a supplementary reading program, RC REINFORCES comprehension, vocabulary, and fluency skills. Counterclaims: The reports do provide information to the teacher regarding who read what, at what Lexile levels, how many pages read, what quiz scores were achieved, who hasn’t taken a quiz for awhile (alerts), and more. Plenty of information about what your students are and are not doing with respect to their independent reading. All interesting information, but information which takes time to input, analyze, and report (whoever says that technology is a time-saver is crazy); and information which RI administrators (like your principal) can access and compare to that of your colleagues. Although not advocated by the authors of the RC program, most teachers do use this data in various ways to provide incentives for participation in terms of rewards and/or grades. Of course, the incentives can become problematic. See my article, The 18 Reasons Not to Use Accelerated Reader for examples. In short, the SAM reports do provide data collection and management functions (ones which could be done by paper and pencil or a simple Excel® spreadsheet in less time at no cost); however, none of these data informs reading instruction. Next, let’s take a look at the claim about empowering educators with actionable data. Remember, the two assessments of the RC program are the three-times per year, Lexile-based HMH Reading Inventory (used for initial placement and subsequent progress monitoring) and the 45,000 quizzes. To my mind, actionable data should mean teachable data derived from prescriptive assessments that are reliable and valid. Let’s examine whether these two assessments provide information which is teachable. For example, let’s say the students in your class take the RI during the first week of school. One of your bright students, Amanda, scores an above grade-level Personal Lexile score of 700, while your class average is 550. With the SAM management software, you are able to use that data to match readers to books. However, other than that use (which we’ve already shown to be of questionable value), those initial RI Lexile scores provide no data to inform our reading instruction. On the RI given 3 months later, Amanda improves to a 750 and her average quiz scores from 80–90%, but your class averages the same 550 Lexile level and has not improved its 70% quiz average. What does that data indicate? Something appears to be helping Amanda improve her reading, but we have no idea what it is. It could be the RC program; it could be the independent reading, itself; it could be the reading instruction you are doing in class, though you may not know exactly what instruction is helping; it could be what her parents are doing at home. Regarding your class, average Lexile and quiz scores, something appears not to be working. But what is the something so we can do something about it? We don’t know. You could look at subgroups and find out that your girls have improved more than your boys, or one ethnic group over the other, etc. But how does the Lexile and quiz data inform our instruction? The short answer? It doesn’t. The RI and quizzes provide no information about which reading skills have not yet been mastered and which have been mastered by Amanda or class as a whole. Neither assessment offers the teacher any specific data regarding what to teach and what not to teach. So why test if it does not provide actionable data? A good question. Of course, teachers have been creating diagnostic and formative assessments for years that do inform their reading instruction in specific sub-skills. Good teachers are more than willing to test when the data pinpoints what needs to be taught and practiced and what does not require repeated instruction. Like many teachers, I’ve developed my own assessments to inform my instruction. I’ve written and field tested 13 diagnostic reading assessments with recording matrices and audio files, which provide teachable data. I provide them free of charge to help your students, and because some teachers would prefer not to re-invent the wheel by creating their teaching resources to correspond to each assessment item. 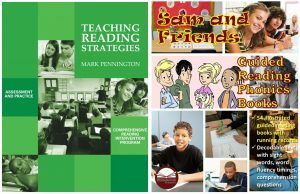 Yes, you can buy those instructional resources from Pennington Publishing. Simply click the link and look in the header to download and print the free assessments. Additionally, skim the Articles and Resources to find over 700 articles of interest to the ELA and reading teacher, including a slew of articles on how to create your own no-cost independent reading program that I think does a better job for students than either the Accelerated Reader™ and Reading Counts! programs. Both the Accelerated Reader™ and Reading Counts! program authors are careful to label their independent reading management programs as supplementary programs, as they should. However, as every teacher knows, instructional time is reductive: if you add on this, you have to take away that. Because both programs are designed for in-class and home practice, AR and RC supplant other instruction, most always reading instruction. Accepting at face value the RC claim that RC REINFORCES comprehension, vocabulary, and fluency skills, my question to teachers would be… Which would help your students improve their reading more? REINFORCING or TEACHING? Feel free to download my SCRIP Comprehension Strategies TEACHING resource at the end of this article as a reward for slogging through this rather long diatribe. I look forward to your comments. These five FREE lessons will help you teach the SCRIP Comprehension Strategies for both grade-level and struggling readers. This FREE download is sent safe and secure to your email, and includes a set of SCRIP Posters and Bookmarks.